Comprehensive fire suppression doesn’t just mean ensuring your entire space is equally covered. It is a holistic approach that starts with general fire safety, includes sprinkler systems and well-situated fire extinguishers. But it also means being prepared to tackle high-risk spots that are more prone to outbreak than others. This is where the spot-protection of the Buckeye Mini-Guard comes in. 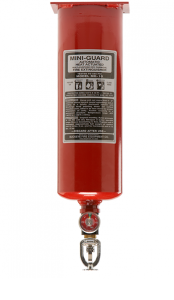 It’s designed to be either horizontally or vertically mounted in areas where you need it most in the event of a fire, and can be equipped to spray multi-purpose (ABC) foam or Halotron agent to deal with specialized electrical fires making the Buckeye Mini-Guard multi-purpose fire suppression system equipped to deal with a variety of issues. At All Florida Fire, we’re proud to offer a wide variety of fire suppression systems for every conceivable client need, including the Buckeye. If you need spot-protection in your workplace, look no further. What Can the Buckeye Mini-Guard Do? As stated above, the Buckeye Mini-Guard is not designed as the be-all-end-all solution for your fire suppression plan. Setting up your workspace in such a way as to discourage fire outbreaks is the number one most important step you can take. After that, there are sprinklers, fire extinguishers and even hoses to tackle an accidental outbreak. So where does the Buckeye fit in? Think of it as a first responder, that can arrive at the scene of an accident faster than any other system you have in place. Some areas of your workplace are just going to be more prone to fires than others. Whether it’s because of flammable materials or even an open flame, having the Buckeye Mini-Guard means these higher risk areas will have a solution poised to deal with a fire problem immediately. With in-built fire sensors designed to accurately determine what constitutes an appropriate blaze to discharge chemicals, the Buckeye Mini-Guard is always on guard to keep your higher-risk areas automatically protected in a way that running for the nearest fire extinguisher will never be able to. One of the best aspects of the Buckeye Mini-Guard is it’s configurable for a variety of needs, and fire risks. This includes coming as a horizontally or vertically mounted solution, and equipped with either multi-purpose ABC dry fire chemicals or a more specific-use Halotron agent. The different mounting options allow you to incorporate the Buckeye Mini-Guard into a variety of spaces and tight fits to ensure its functional wherever it needs to be. The option to choose the fire suppressant means that you can keep conventional fires from getting out of control, and even opt to tackle tougher electrical blazes if need be. This fire suppression system doesn’t simply make the claim to be effective, it backs it up. The Buckeye Mini-Guard is designed and manufactured to meet the extremely rigorous standards outlined by the Underwriters Laboratories (UL) for commercial hazard protection. And it doesn’t stop there — Buckeye itself backs their product with a manufacturer’s warranty to give you peace of mind when purchasing. As for the nuts and bolts of the system itself, the Buckeye Mini-Guard is well built with anodized metal and brass valves,steel and aluminum cylinders all coated in a polyester powder coating which creates a tough, corrosion resistant product that can stand up to even rough treatment. The Buckeye Mini-Guard comes equipped with metal pull pins, brackets and even wall hooks so you can mount and maintain your unit to optimize its longevity and usage. It also comes with handy color-coded gauges to offer you quick and easy operating status information. Maintenance is made easy with serial number barcoding to assess maintenance history in quick and accurate fashion. For nearly three decades, All Florida has provided industry leading fire suppression systems, like the Mini-Guard, to offer protection for what matters most. If you’re near the Tampa, St. Petersburg, Clearwater, Lakeland, Largo, Sarasota, or Bradenton areas, don’t hesitate to reach out. Call us at 727-525-5950, or email us at service@allfloridafire.com. If you prefer, fill out our easy Contact Us form, and we’ll be in touch.